When you retire, you may qualify for coverage as a Senior Performer based upon your work history. Benefits for Senior Performers are the same as those provided to Participants with Earned Eligibility under Plan I, except that the life insurance benefit for Senior Performers is $5,000 instead of $10,000 and no accidental death and dismemberment benefits are provided. It is important to note that benefits for Senior Performers are offered through the SAG-AFTRA Health Plan and are not part of the benefits provided by the AFTRA Retirement Plan or the SAG-Producers Pension Plan. Like all benefits under the SAG-AFTRA Health Plan, Senior Performers benefits are not guaranteed and may be amended, modified or terminated at any time for those who are or may become covered by these benefits. Have at least 20 Retiree Health Credits (see below). Retirees with less than 20 Retiree Health Credits may be eligible when they turn 65 if, as of January 1, 2017, they had at least 15 qualifying years under the AFTRA Health Plan or at least 15 pension credits under the SAG-Producers Pension Plan, and they were at least age 55. Participants who were born on or before January 1, 1943 with at least 10 qualifying years under the AFTRA Health Plan. met all the requirements in effect at that time for retiree coverage under the AFTRA Health Plan. Participants who had at least 10 pension credits under the SAG-Producers Pension Plan as of December 31, 2001, and who were at least age 55 as of December 31, 2002. As you meet Earned Eligibility requirements throughout your career, you may also earn Retiree Health Credits. As of January 1, 2017, if you earn at least $22,000 in Covered Earnings during a calendar year, you earn a Retiree Health Credit for that year. Effective January 1, 2018, and on January 1 of every year thereafter through 2022, the Covered Earnings threshold to earn a Retiree Health Credit is scheduled to increase by $1,000. If, as of December 31, 2016, you are eligible for or are receiving health coverage under either the AFTRA Health Plan’s Senior Citizen Health Program or the SAG-Producers Health Plan’s Senior Performers benefit, including occupational disability pensioners receiving Senior Performers coverage under the SAG-Producers Health Plan, you will be eligible for Senior Performers coverage under Plan I of the SAG-AFTRA Health Plan beginning January 1, 2017. The AFTRA Health Plan and the SAG-Producers Health Plan had different eligibility rules for retiree health coverage. Under the AFTRA Plan, participants had to accrue at least 15 qualifying years in order to be eligible for retiree benefits. Under the SAG Plan, participants had to accrue at least 15 SAG-Producers Pension Plan pension credits in order to be eligible for retiree benefits. Pension credits earned under the SAG-Producers Pension Plan’s Alternative Eligibility Program did not count toward retiree health eligibility. 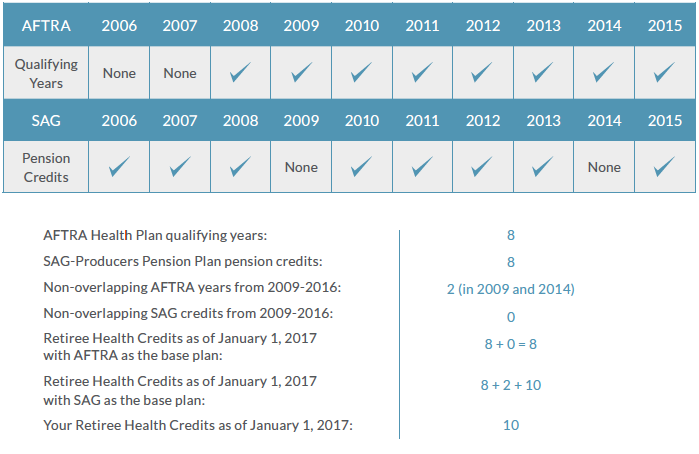 Participants who have accrued AFTRA Health Plan qualifying years and/or SAG pension credits toward retiree health coverage prior to January 1, 2017 will be able to carry forward those years/credits to the SAG-AFTRA Health Plan as follows. 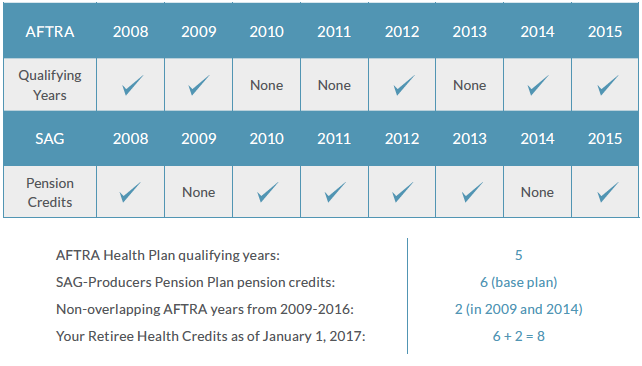 If you have accrued AFTRA Health Plan qualifying years toward retiree health coverage and you have not accrued any pension credits under the SAG-Producers Pension Plan, you will carry forward all your AFTRA Health Plan qualifying years earned as of January 1, 2017. If you have accrued SAG-Producers Pension Plan pension credits toward retiree health coverage and you have not accrued any qualifying years under the AFTRA Health Plan, you will carry forward all your SAG pension credits earned as of January 1, 2017. AFTRA qualifying years were earned based on a 12-month period from December through November. For the purpose of determining non-overlapping years, an AFTRA qualifying year will be considered to have been earned during the year applicable to the period January through November. For example, an AFTRA qualifying year that was earned from December 1, 2006 through November 30, 2007 will be considered a 2007 year. Your pension credits under the SAG-Producers Pension Plan. The Plan in which you had the greater number of years or credits will be your base plan. You may also be able to carry forward additional years or credits from the other plan that were earned during the period 2009 through 2016, provided they do not overlap with any of the years or credits in your base plan. If you have the same number of years or credits in both plans, your base plan will be set as the plan which yields the greatest number of Retiree Health Credits when combined with the non-overlapping years or credits from 2009 through 2016 under the other plan. Please see the examples below. 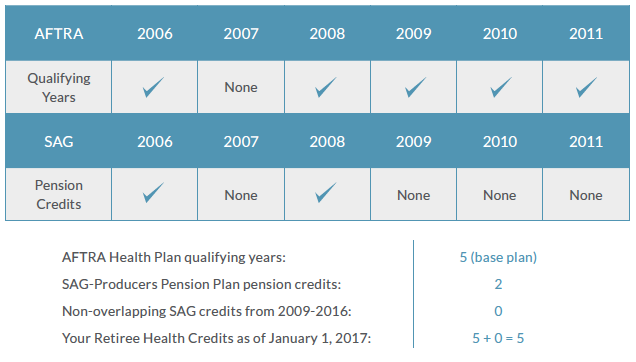 Participants who have earned a qualifying year under the AFTRA Health Plan or a pension credit under the SAG-Producers Pension Plan as of December 31, 2016 will receive a letter from the Plan indicating their number of Retiree Health Credits. If you have not received your letter by February 2017, or if you have questions about your Retiree Health Credits please contact the Plan at (800) 777-4013. Occupational disability pensioners under the SAGProducers Pension Plan are eligible for Senior Performers health coverage at any age, provided they have at least 15 Retiree Health Credits. Occupational disability pensioners may not count any AFTRA Health Plan qualifying years toward the 15 Retiree Health Credit requirement. In order to be eligible for an occupational disability pension, your injury must have occurred while working under a Collective Bargaining Agreement for which contributions were made to the SAG-Producers Pension Plan. For a complete description of the occupational disability pension requirements, please refer to the SAG-Producers Pension Plan SPD. Senior Performers coverage will begin on the first day of the month in which you meet the eligibility requirements, unless you have Earned Eligibility, in which case your Senior Performers coverage will begin on the first day of the month following the month in which you lose Earned Eligibility. For occupational disability pensioners, coverage begins when Medicare disability coverage begins. You must pay the required premium (Senior Performers premiums as of January 1, 2017). Eligibility will continue each calendar year – the Benefit Period for all of those with Senior Performers coverage under the Plan. Enrollment for Senior Performers coverage is handled in the same manner as enrollment for Earned Eligibility coverage. Learn additional information, including when you can make changes to your covered Dependents,. Senior Performers coverage will provide coverage secondary to Medicare for Hospital and medical benefits – unless you regain Earned Active Eligibility. You must be enrolled in Medicare Parts A and B to qualify for full Plan coverage. If your spouse is age 65 or older, or qualifies for Medicare due to disability, your spouse must also be enrolled in Medicare Parts A and B to receive Dependent coverage under the Plan (when the Participant is a Senior Performer). You and your spouse do not need to enroll in a Medicare Part D Prescription Drug Program, as pharmacy benefits are included with Senior Performers coverage. Please see here and here for additional information about coordinating benefits with Medicare. If you become a Network/Station Staff. The Surviving Dependent benefit provides Senior Performers health benefits to your eligible Dependents when you die, provided you meet certain requirements at the time of your death. An eligible Dependent includes your Dependent children and your surviving spouse, provided you and your spouse were married for at least 12 months immediately preceding your death. You were at least age 50 at death, had at least 20 Retiree Health Credits, and your age plus Retiree Health Credits was at least 75. Coverage for your Dependents will begin on the date you would have turned 65. If, as of December 31, 2016, you are eligible for or are receiving health coverage as a surviving dependent under either the AFTRA Health Plan’s Senior Citizen Health Program or the SAG-Producers Health Plan’s extended spousal benefit, you will be eligible for Surviving Dependent coverage under Plan I of the SAGAFTRA Health Plan beginning on the later of January 1, 2017, or the date the Participant would have turned 65. Coverage for your surviving spouse will continue until your spouse remarries or dies, provided the Plan premium is paid. Coverage for Dependent children will continue until they no longer meet the Plan’s definition of a Dependent. The Plan requests verification of the marital status of all surviving spouses covered under this benefit annually during the Open Enrollment Period. Eligibility for this coverage will not be extended unless the Plan receives a completed questionnaire. In some cases, Dependents may be able to continue coverage under COBRA after their eligibility for Surviving Dependent benefits ends (see “Special Rules for Dependents”). Your Dependents will be notified by the Plan if this additional coverage is available. Surviving Dependent eligibility may be replaced with Earned Active Eligibility if the Participant met one of the requirements outlined above under “Regaining Earned Active Eligibility” for a subsequent Benefit Period. If this happens, the Dependents will receive earned Plan I coverage. If you and your spouse BOTH have Senior Performers coverage under the Plan and one of you dies, the surviving spouse will not receive Surviving Dependent coverage. This is because the surviving spouse will continue to receive his or her own Senior Performers health coverage – which pays secondary to Medicare – as long as the required premiums are paid on time. Note: Surviving Dependent benefits are not guaranteed and may be amended, modified or terminated at any time.